This was a couple of days ago. It looked better in real life - more red in the clouds. The camera phone takes such grainy looking photos and you can't control the exposure at all. Oh, well. I'm impressed with your photos, my dear. 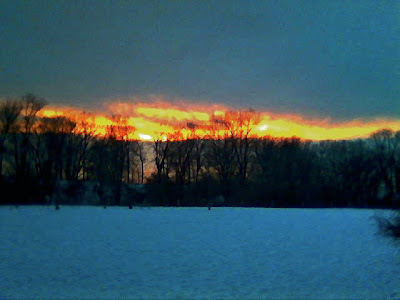 I've seen some pretty spectacular sunsets and moonrises at the bark park, myself, but the phone camera intimidates me! Neat photo. I love how the sun looks. Oh, by the way Ed, grainy photographs are "in". So are IPhones! Do you have your iPhone yet, poodledoc? By the way, speaking of iPhones, I visited the new Apple store last week. What a trip! You should check it out.